Sadly, blogtober is nearly over but that means that it's time to reflect on everything that's been making me happy throughout this busy, changeable, blustery month. 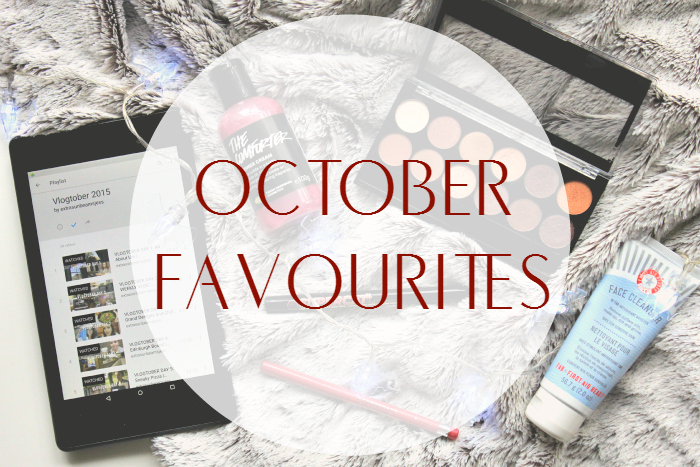 I've been so busy with blogtober that I haven't really had a lot of downtime to indulge and enjoy things as much, but over the month I've taken note of the little daily things that have been making me happy so that's what I'm sharing with you today. I mentioned this blanket in my Autumnal Haul post and it's probably the best thing I bought this month. It's been making my days and nights super cosy and whether I'm frantically writing blogposts or curled up watching Netflix, you can be sure I've been snuggled under this blanket. It's so gorgeous and soft and such a bargain so head to your local Primark and get one before they're all gone! I've loved watching everyone's vlogtober videos this month but I've been particularly enjoying SunBeamJess' vlogs. I stumbled across her main channel at the beginning of the month and was instantly charmed by her down to earth personality and amazing style, I was so pleased to see that she was doing vlogtober and I've been hooked ever since. It's been really nice to see university life through her eyes and it's making me nostalgic for my own uni days, especially as she's studying English Lit like I did. I freaked out when I found this little beauty on a trip to Lush Nottingham earlier this month as I thought these new Comforter shower creams were exclusive to the Oxford Street store - apparently not! This is my absolute favourite scent by Lush so I'm really happy to have it in shower gel form and I'm now wishing I'd bought a bigger bottle! I've had this palette for so many years, I don't even know when I bought it, but I rediscovered it this month when looking for orangey/coppery eyeshadows, as I was craving more autumnal makeup looks. This palette contains 12 eyeshadows in varying warm shimmery shades. In my opinion it's a pretty good dupe for the Naked one palette, the shadows are all nicely pigmented and blend smoothly, and at only £4.00 you can't go wrong. I've been using this pretty much every time I've worn makeup this month. This month I noticed that I was running out of my beloved First Aid Beauty 'Ultra Repair Cream' moisturiser so I decided to pick up the First Aid Beauty 'FAB Faves to Go' kit which contains the Ultra Repair Cream, the Facial Radiance Pads and the Face Cleanser. I've had this kit before and I think it's such good value for money and a great introduction to the brand. I've got really sensitive skin so I'm careful about skincare products but all of these are great and so gentle on my skin. I particularly love the cleanser as it's so great for a second cleanse or a morning cleanse in the shower - it's just so gentle and hydrating, it doesn't leave my skin feeling tight at all. Give this kit a go if you're looking for some pretty affordable but slightly higher end skincare! I didn't realise how much I loved this lip liner until it unexpectedly ran out earlier this month. The only bad thing about it is that you can't tell when it's going to run out so I had an upsetting moment half way through using it one day when it just wouldn't turn anymore! As the days went on I realised how much I was missing it so I had to go out and buy a replacement. It's just the perfect liner to wear under pretty much any lipstick to emphasise the colour and increase the wear-time of the lipstick. I absolutely love it and now know I can't live without it! I've never really been one for liquid eyeliner because I've never found a really good one before, it always just took too long and ended up messy or wonky - so I kind of gave up. I'd been hearing people talk about the Supercat liner for years but never bothered to pick it up until I was casually browsing Boots one day this month and feeling a bit spendy. Well, I bought it and let me tell you; I'm in love! It's seriously the easiest eyeliner I've ever used, it's really easy to do a thin or thick line and takes about 30 seconds and then doesn't budge all day. I've been wearing it most days since and I'm definitely a liquid liner convert.